Located near the tip of Barter's Point, this charming cottage has filtered views of the harbor and offshore islands. It is only a 2 minute stroll to our shorefront access where kayaks or other watercraft can be launched. The cottage has three bedrooms:one with a queen-sized bed, and two with full size beds. There is an eat-in kitchen,a new full bath with a tub/shower(renovated in 2015) and a fire-placed living room. Enjoy beautiful Maine summer days from the sunny deck which is outfitted with comfortable adirondack chairs, or dine outside at the picnic table. The cottage is equipped with broadband internet, Cable TV, a DVD player with a collection of DVDs, and a telephone with local service. For those early spring and late autumn days, there is also central heat. 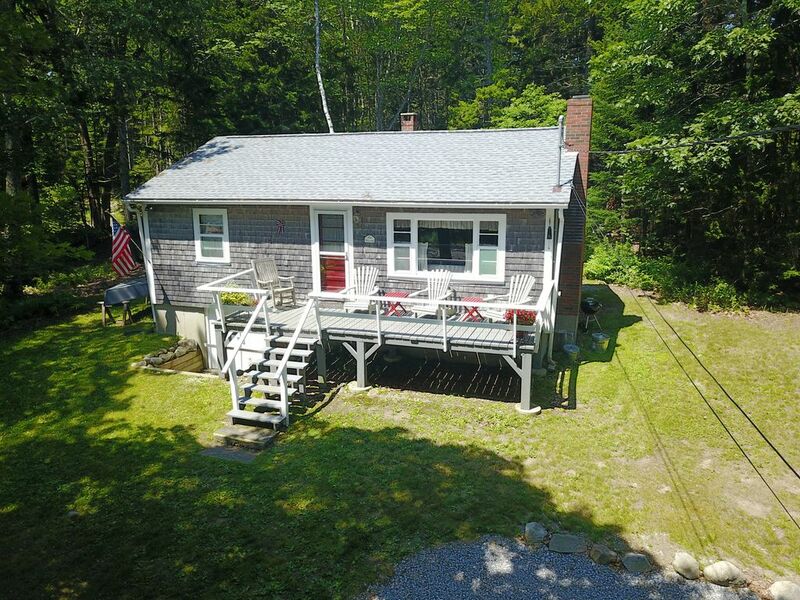 The weathered gray cottage is a great place to enjoy the simple pleasures of Mid-Coast Maine. Kayak out of the cove and 'hug' the coastline or explore the waters around the offshore islands before heading into the harbor that is dotted with lobster boats and yachts during the summer months. Stop at the public landing and pick up a snack at the general store before continuing on your way. Would you rather take a scenic stroll or go for a short drive? Head toward the village and enjoy the water view along the way. Smell the salt air. Drop by the bakery for a breakfast croissant. Pick up a book to read at Jackson Memorial Library which also has WiFi. Continue on to Granite Gardens for a cup of coffee in a peaceful setting. A rustic or refined lunch or dinner can be had in either local restaurants or in those a short drive away. Tour Marshall Point Lighthouse a few miles down the road in Port Clyde. Or, go up to Rockland. There, you can walk up to the lighthouse at Owl's Head. Then walk out to the lighthouse at the end of the breakwater in Rockland Harbor. There are photo opportunities everywhere. Go on to Rockport, and Camden. Drive, climb or mountain bike to the top of Mt. Battie. Delight in the view of Camden and the offshore islands. Picnic areas are located at the base of the mountain. Browse the shops as you walk around Camden Village or purchase a 2-4 hour cruise of Penobscot Bay on one of the schooners located in Camden Harbor. Another great daytrip is to book passage on the ferry from Port Clyde for a trip to Monhegan Island. Bring a picnic lunch,and enjoy the scenic views as you hike around the island before returning the same day. A multiplex movie theater is located in Thomaston. A public golf course is located in Rockland. Enjoy shopping, antiquing and visiting the art galleries and museums in the surrounding areas. You can either dine in or dine out on fresh Maine seafood. After dinner, relax on the cottage deck and enjoy the onshore breeze as you watch the sun set, or sit in front of a crackling fire and read a good book, play a board game,or plan your activities for the next day. Born and bred on the East Coast I never tire of returning to my 'roots'. My summer and fall destination is ALWAYS Maine. My grandfather was from Tenants Harbor. My father returned to the "Harbor" and bought property on Barter's Point and built cottages for his family to enjoy. Our family spent several weeks each summer enjoying the quiet beauty of the area. Now, my own children and grandchildren return to Maine, taking time off from their busy lives to enjoy a place that is very special to us all! The cottage is within walking distance of the village. We have shoreline access just 2 minutes away! We really enjoyed our week at the weathered grey cottage. We were very impressed with how clean and nicely appointed it is. You can tell that the owner has spent a lot of time here making it just so. We just love the midcoast area but this was our first time in Tenants Harbor - a very charming little village! Thanks Deb for making this such a no hassle get away. We are delighted that you enjoyed your stay at the Weathered Grey Cottage and would welcome you once again if your travels bring you back to Tenants Harbor. Still reeling from my wife's death six months ago this was the perfect place for me to spend much needed alone time. The cottage is lovely and stocked with every cooking item anyone might need. Thank you. September and a October at The Weathered Gray Cottage is a favorite time of year for many. The hustle and bustle of the summer months is over and the quiet interlude before winter is peaceful and relaxing. I am glad that the cottage suited your needs during a difficult time. Very accommodating and comfortable. Easy to reach shopping areas and light houses. We are happy that you enjoyed your stay at The Weathered Gray Cottage. Marshall Point Lighthouse is just a few miles down the road and Owls Head Lighthouse and the Rockland Harbor Lighthouse are nearby. There are stunning views from all. The Town of St George Maine has several hiking trails and for those who are more hardy, the hike to the top of Mt Battie in Camden provides breathtaking views.We enjoy our time at the cottage and we are delighted that you did as well. Small but cozy. Well appointed. It was a nice, cozy cottage that had all the amenities we needed for a comfortable stay. The owner was very responsive and helpful. The location was, in our opinion centrally located to several lighthouses, shopping areas, and short hikes. Thank you for your review! Tenants Harbor is a short distance from several lighthouses, each with its own individual character. Marshall Point Lighthouse and Museum houses the genealogies of the early families that settled in St. George Maine, Rockland Harbor Breakwater Lighthouse offers visitors the opportunity to hike the mile long breakwater at the edge of the harbor to reach the lighthouse and enjoy the views along the way. Midcoast Maine is such a beautiful area. We are happy that you found the cottage comfortable and well equipped. Every year we look forward to our week in Maine. Two years ago we stumbled on the Weathered Cottage and couldn't wait to return this year. The cottage is outfitted with everything you need. It is cozy and comfortable while still being roomy. Early mornings and late nights on the deck are the best times. It is amazingly clean and well kept up. It is close to everything and in a really pretty area that is perfect for walks. We are already looking forward to next year. Thank you for your lovely review. Enjoying my morning coffee on the deck while reading a book is indeed a special time! We strive to make our cottage comfortable and well equipped and are delighted that you found it to be so. We are looking forward to seeing you again if your plans bring you to Tenants Harbor. We're happy to hear that you feel that you are "coming home" when you visit the cottage. We try to anticipate the needs of our guests and equip the cottage with that in mind. The small cove across the street provides access for our guests to launch their kayaks, or to take in the view of the offshore islands. We're delighted that you enjoyed the simple pleasures that Tenants Harbor has to offer while staying at The Weathered Gray Cottage. We look forward to seeing you again! Access to the waterfront where a kayak or other small watercraft can be launched. A linen Option including sheets, pillowcases, and towels is available for a $85.00 fee + Tax for up to 4 people. One pet (dog)may be considered after submission of a picture. No aggressive breeds are allowed. A larger damage deposit is required in addition to the $100.00 pet fee if the pet is allowed. No cats are allowed.